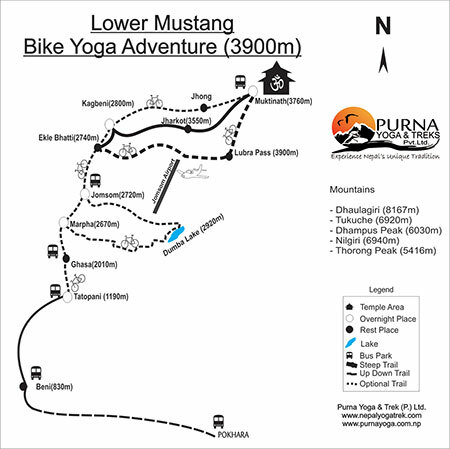 Join us for this unique program of Yoga Biking Adventure among the Himalayan landscapes of Nepal. 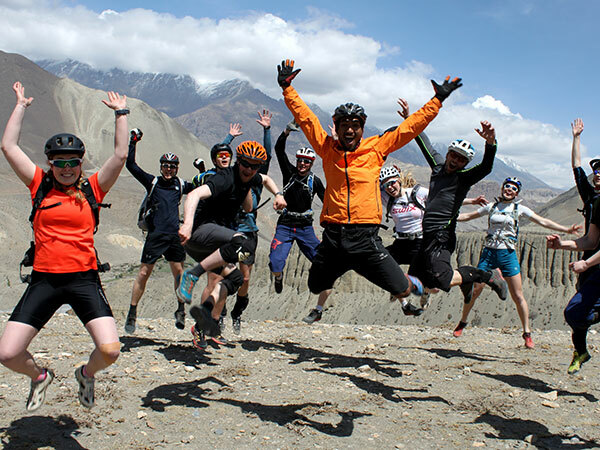 This program is suitable for organized groups of 10-14 pax and it combines a daily practice of yoga and stretching with a biking adventure in the area of Jomsom Muktinath – a biker’s paradise among the Himalayan mountain ranges. This biking trail offers a good mixture of challenging uphill, thrilling downhill and technical single track as well as plenty of local culture and tradition. During this tour we begin our days with a gentle practice of morning yoga to stretch our muscles as well as gain flexibility and balance before we start the day of cycling through breathtaking landscapes and traditional villages steeped in local culture and history. Yoga helps to stretch our muscles, maintain stamina and prevent muscle tightness and soreness. 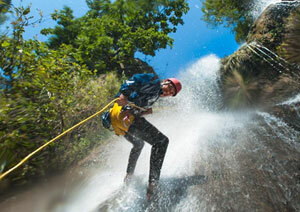 We also gain focus, clarity and mindfulness to enjoy our adventure to the fullest. 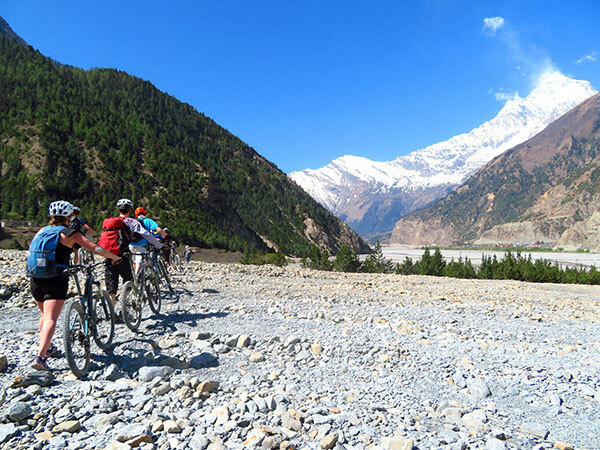 Jomsom-Muktinath trail leads through the world’s deepest river gorge – the Kali Gandaki gorge, which splits the massive peaks of Annapurna and Dhaulagiri. The trail crosses through local settlements and hanging bridges, passing through wide riverbeds as well as some narrow paths of the Lubra Pass. This is a trail with spectacular vistas of the valley, hills, raging mountain river, waterfalls, rugged landscapes and of course snow capped mountains. This is a Trans-Himalayan region, protected from the monsoon by the high passes and mountains to the south. 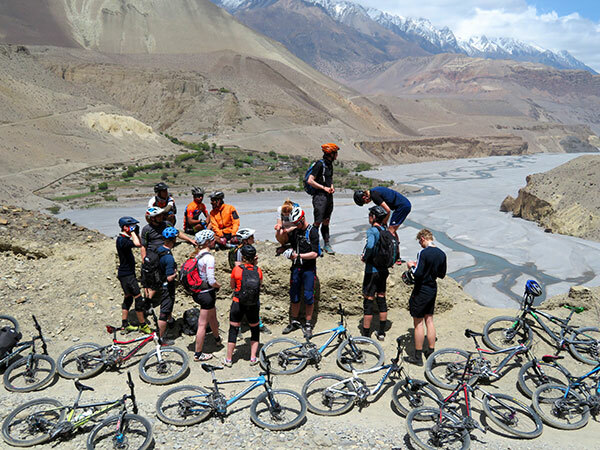 There is a dramatic change in scenery as we move north of the great Himalayan divide and we are now in the vicinity of Tibetan Plateau to witness a stark and rugged landscape. The culture here is predominantly Buddhist and we get to visit several Buddhist monasteries on this trail, one of which is a modern monastery in Marpha and one very old monastery from the 15th century, in Kagbeni. Muktinath is the highest point of this trail at 3,710m /12,170ft and it is a place equally sacred for both Hindus and Buddhists alike. The temple in Muktinath is often called as Mukti Kshetra, which literally means the “place of salvation”. The outer courtyard of the temple has 108 bull faced taps, where the devotees take sacred baths for purification and salvation. Lower Mustang area is a land where 8,000m/26,250ft high mountains cast a shadow over the world’s deepest river gorge. The charm of this natural beauty is enhanced by the addition of picturesque stone villages dotted along the way, Buddhist monasteries and prayer walls. 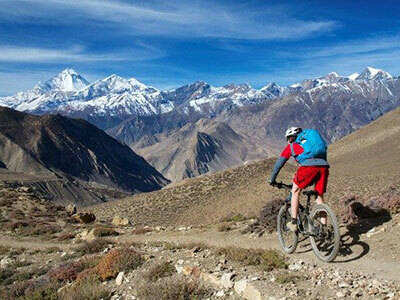 This trail provides many spectacular views of the two Himalayan giants –Dhaulagiri and Nilgiri mountains with a flavor of the Tibetan like country side. 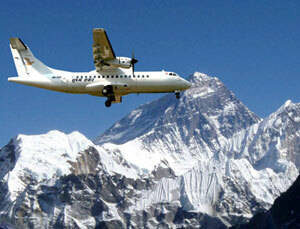 You arrive in Nepal at Kathmandu airport and we welcome you on arrival and transfer you to a hotel in Kathmandu. Welcome dinner. Overnight stay at a hotel in Kathmandu. 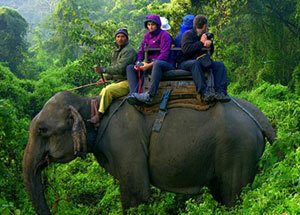 After breakfast there is a half day sightseeing tour of Kathmandu with a guide. We visit Bouddhanath Stupa and Patan Durbar Square. Overnight stay at a hotel in Kathmandu. After breakfast we drive to Pokhara with private transport. During the drive you will already have stunning views over the mighty Himalaya massifs as well as green hills and dramatic river valleys. Preparation activities for the trek - detailed briefing, last minute shopping and packing. Overnight stay at a hotel in Pokhara. 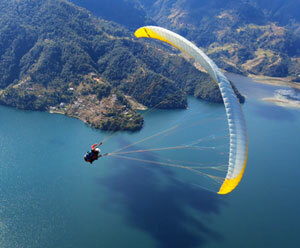 A day to rest and to discover the Lakeside area of Pokhara. 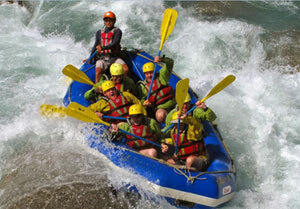 There is a boating tour on the lake and preparation activities for the departure on the following day. Overnight stay at a hotel in Pokhara. We take private road transport to Jomsom. This is a long 9hr drive and half of the drive is on a bumpy road but we are compensated with wonderful views and landscapes on the way. Overnight stay at a teahouse in Jomsom. 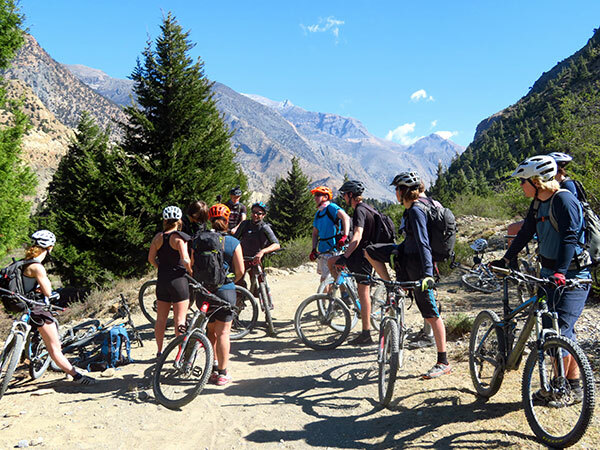 After morning yoga and breakfast we make a biking tour in the area surrounding Jomsom, we visit Dumba Lake and a secluded Buddhist monastery atop a mountain ridge so we have some climbing to tackle, but also great downhill. After lunch we cycle to Kagbeni. The trail is a jeep track road and mostly flat, however we might get some strong wind on the way and it can get dusty so wrap up. We arrive in the ancient village of Kagbeni with cobbled streets and a 15th century monastery. We have time to stroll through the village and observe the local life in the afternoon. We stay overnight is a teahouse in Kagbeni. Today we take a day to acclimatize in Kagbeni and to explore the surroundings. There is a small very old monastery to visit here and wonderful views over the Nilgiri mountain (7061m) in this charming traditional settlement. 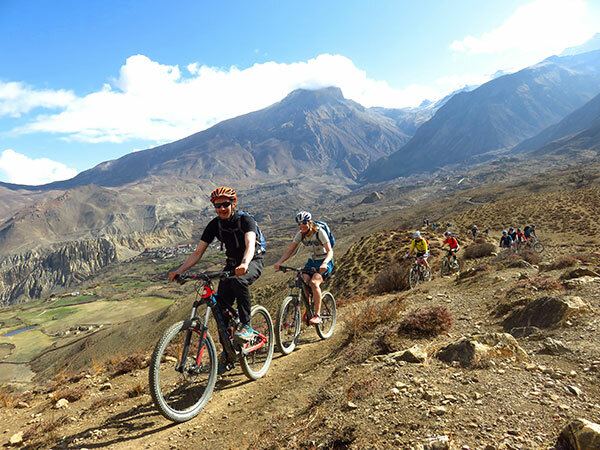 We make a biking tour to Tiri, a small village in Upper Mustang, where we can climb up to the nunnery, from where we can admire a great view into the valley of Upper Mustang and great mountain views. 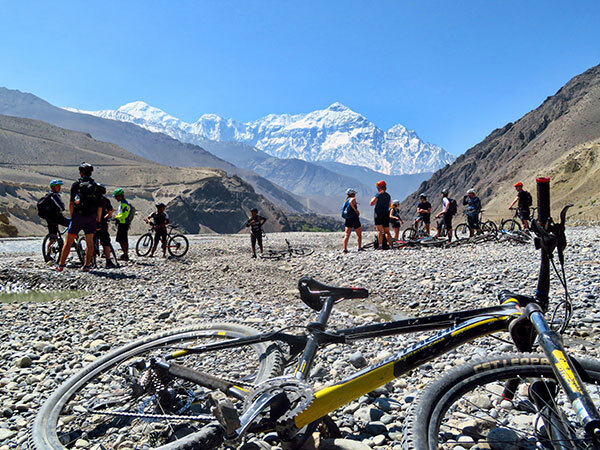 You may also wish to try your luck in searching the riverbed of Kali Gandaki for Nepal’s famous black stones containing ammonite fossils millions of years old. There is also a little café here serving Italian coffee in support of the local monastery’s development. Overnight stay at a teahouse in Kagbeni. 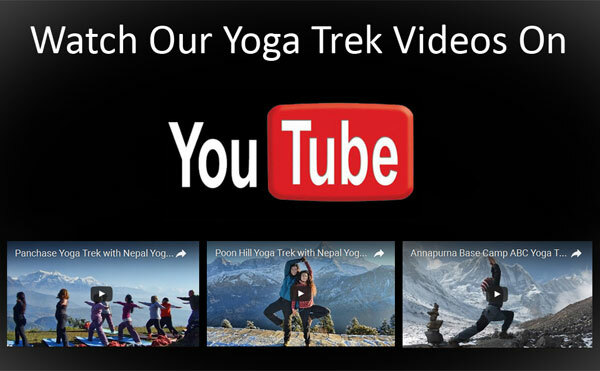 We wake up early for sunrise over Mt Nilgiri and for the yoga session. 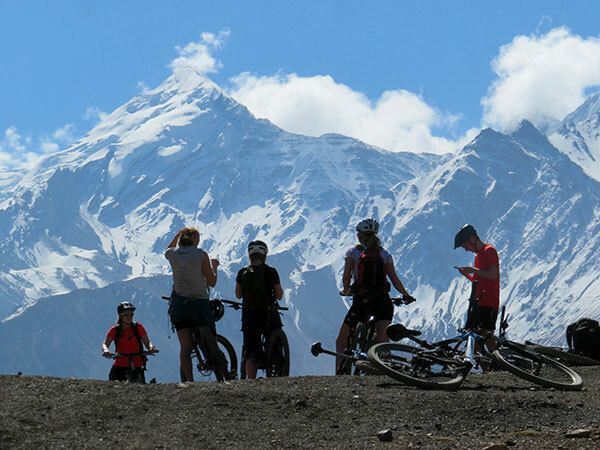 After breakfast we start cycling towards Muktinath and it is going to be mostly uphill today on a jeep track road and the higher we climb, the better the mountain views before us. We will stop to explore a small village of Jung on the way with another ancient monastery and stunning vistas all around. After reaching Muktinath we have a chance to visit one of the holiest places for Hindu and Buddhists alike – the Muktinath Temple with 108 bull faced taps, where pilgrims travel from far and wide to purify their souls and grant themselves Mokshya – Liberation. We stay overnight in a teahouse in Muktinath. After early morning yoga we have some breakfast and get ready for a fun downhill ride all the way to Marpha. We have a choice for a jeep track trail or a bit more challenging and fun single track through Lubra Valley, depending on our mood and the trail conditions at the time. Marpha is a beautiful stone village famous for growing apples and you can feel like you stepped back in time walking through the narrow stone streets here. We can explore the local monastery, from where we get a bird’s eye view over the village and the whole area. We stay overnight in a teahouse nearby Marpha. 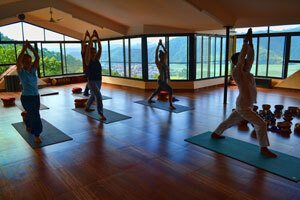 We get up early to view the sun rising over the valley and to stretch our bodies in yoga class. After breakfast we start riding all the way down to Tatopani, alongside Kaligandaki river for most of the day. We stop for lunch by a large waterfall and keep riding mostly downhill until we reach Tatopani, where there are hot springs so we can soak our tired bodies here. We stay overnight in a teahouse in Tatopani. After our last morning yoga session we have breakfast and depart for the last leg our the tour, driving down to Beni through green and lush scenery albeit through a dusty jeep track road. From Beni we get transport back to Pokhara. Farewell dinner. Overnight stay at a hotel in Pokhara. You return to Kathmandu with a private road transfer, this is an approximately 7-8hr drive with some short breaks along the way. Overnight stay at a hotel in Kathmandu. We drop you off at Kathmandu airport, wish you a safe journey back home and hope to meet you in Nepal once again. Healthy snacks that we carry with us – fresh fruit, nuts, cheese, dried fruit, oat biscuits etc. Note: Each day is different, depending on a number of factors ranging from availability of some facilities and trail conditions to the general pace of the whole group. Exact timetable cannot always be followed and would in fact destroy the free and easy going atmosphere of the tour that you have come along to enjoy. Therefore the following schedule serves as a general guideline only. 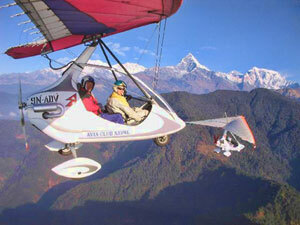 Pokhara offers a range of ultralight flight experiences. 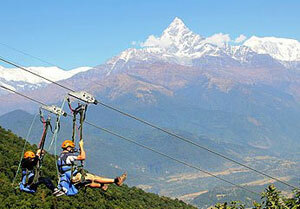 The shortest flight is just 15min and it takes you around Pokhara Valley with a mountain panorama view. A 30min flight can take you around the valley and also bring you close and personal with the Fishtail Mountain. The 60min flight takes you into the heart of the mountains, where you will fly in between the Himalayan mountain ranges for a once in a lifetime experience and an incredible vantage point to snap some stunning photos. 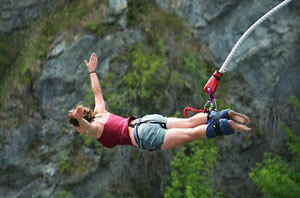 All tours require a booking deposit of 200 USD per person at the time of booking. Booking deposit payment can be made by bank transfer or by Western Union. The remaining balance can be cleared upon your arrival in Nepal by cash or credit card (credit card payment incurs a 4% charge). Your safety is our number one priority and the tour leaders have an authority to make changes in the itinerary based on their risk assessment due to weather or trail conditions while the tour is in progress. 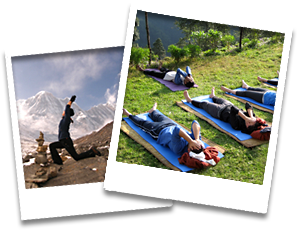 Purna Yoga & Treks Pvt Ltd will not be liable for any accident, injury, health problem, emotional distress or any other health condition suffered by the client during the trip. Our packages do not include any kind of personal insurance so it is guests' own responsibility to purchase travel insurance from their own country before their trip starts. Similarly Purna Yoga & Treks will not be liable for any loss or damage of property, lost or stolen valuables or luggage. Hired bicycles are full suspension and are of varied brands and models, mostly Scott / Giant / Focus etc. The bicycle size will be provided according to guest’s height. We can provide hired bicycle helmets, but we recommend that you have your own for the perfect fit and for hygiene reasons. During the bike tour we provide small repairs along the way – like tightening the brakes or fixing a flat tyre. Bike insurance is not provided so you are financially responsible for any major damage to the bicycle in your use for the duration of the cycling tour.